As the world’s only metropolis that extends into more than one continent, Istanbul straddles Asia and Europe, with the Bosphorus Strait separating the two continents. Not only that the eastern part of Istanbul situates in Asia and its western part situates in Europe, Istanbul is also at the cross road for trade between Asia and Africa and between Europe and Africa. Because of this strategic location connecting the three continents of Asia, Europe, and Africa, and of a huge, beautiful harbor, Istanbul has been a key city for many empires during its 3,000 years of existence, and is known by many names: Byzantium, Constantinople, and Istanbul. Istanbul today is a megacity with over 13 million people, or about 18% of Turkey’s population of 73 million. It is the largest city in Turkey, and is the cultural, economic, and financial center of Turkey. How did this metropolis come into existence? Even though there were people living in this area for many centuries, Istanbul came into existence as a city around the 7th Century B.C.E. when a large number of Greek colonists moved there. These Greek colonists were led by King Byzas, who named the city Byzantium after himself. A few centuries later, Rome grew and established the Roman Empire in the first century B.C.E. As the Roman Empire expanded, its tenacles naturally also reached the strategically located city of Byzantium (see map on the strategic location of Byzantium with respect to Asia, Europe, and Africa; zoom out 4-5 clicks to see a larger geographical area), and Byzantium officially became part of the Roman Empire in A.D. 73. The city also transformed from mostly Greek to a mixture of Greek and Latin in language and culture. Even though the city was known as Byzantium, it was actually associated with the Roman Empire, and not with the later Byzantine Empire as discussed next. In 313 (before he became the ruler of the whole Roman Empire), Constantine, the Emperor of the Western Roman Empire, and Licinius, the Emperor of the Eastern Roman Empire agreed and issued the Edict of Milan that proclaimed religious tolerance in the Roman Empire. This stopped the persecution of Christians (as well as believers of other faiths) and also returned confiscated Christian church properties. Constantine converted to Christianity in 312 and was the first Christian Roman Emperor. 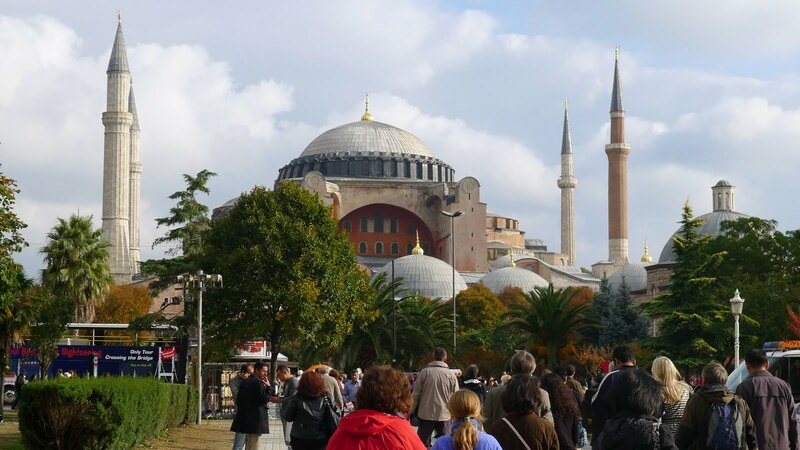 To honor the Roman Empire’s new religion, a large cathedral was built in 360, and this cathedral in its third version is called Hagia Sophia, or the Church of the Holy Wisdom. The original church was destroyed by fire from rioters in 404, and the second church built on this site in 415 was also destroyed by fire from rioters in 532. The current magnificent structure was built in 537. It was the largest cathedral in the world for nearly a thousand years, and is famous for its massive dome. It is considered to be the epitome of Byzantine architecture and sometimes referred to as the building that changed the history of architecture. It was designed by the Greek physicist Isidore of Miletus and the Greek mathematician Anthemius of Tralles. Hagia Sophia served as the main Eastern Orthodox Christian church of the Byzantine Empire. The four minarets (vertical spires) were added during the Ottoman Empire when Hagia Sophia was changed from a Christian cathedral to an Islamic mosque. Click on the picture to get a full-size picture. The Western Roman Empire declined and its emperor was deposed by German mercenaries in 476, thus ending the Western Roman Empire. However, the Eastern Roman Empire continued to flourish for another thousand years until 1453. Since the Eastern Roman Empire was more Greek in language and culture from that of the Western Roman Empire which was more Latin, the Eastern Roman Empire is known as the Byzantine Empire. The Byzantine Empire had a long history of over 1100 years (324-1453). However, Constantinople began to decline after the Fourth Crusade (1202-1204). During its last 200-plus years, the Byzantine Empire often flip-flopped between decline and progress. Finally in 1453, it was conquered by the Ottoman Turks (nomadic tribes from Central Asia), led by Sultan Mehmed II. Almost immediately Constantinople became the capital of the Ottoman Empire, and the capital name was changed from Constantinople to Istanbul. With the conquer of Constantinople, the Ottoman Turks changed from a nomadic horde to the heirs of the most ancient surviving empire of Europe. Their success was due partly to the weakness and disunity of their adversaries, and partly to their excellent and far superior military organization. The Ottoman Empire was one of the largest and longest lasting empires in history. At the height of its power under the reign (1520-1566) of Suleiman the Magnificent, the empire was one of the most powerful states in the world. Great changes occurred as the Byzantine Empire became the Ottoman Empire. Religion changed from Christianity to Islam. Language and culture changed from Greek to Turkish. To have a symbolic representation of the new Islamic religion that could rival and even surpass the Christian cathedral Hagia Sophia in grandeur and beauty, Sultan Ahmet I in 1616 built the Blue Mosque. The Blue Mosque aims to overwhelm you with its size, majesty, and splendor. 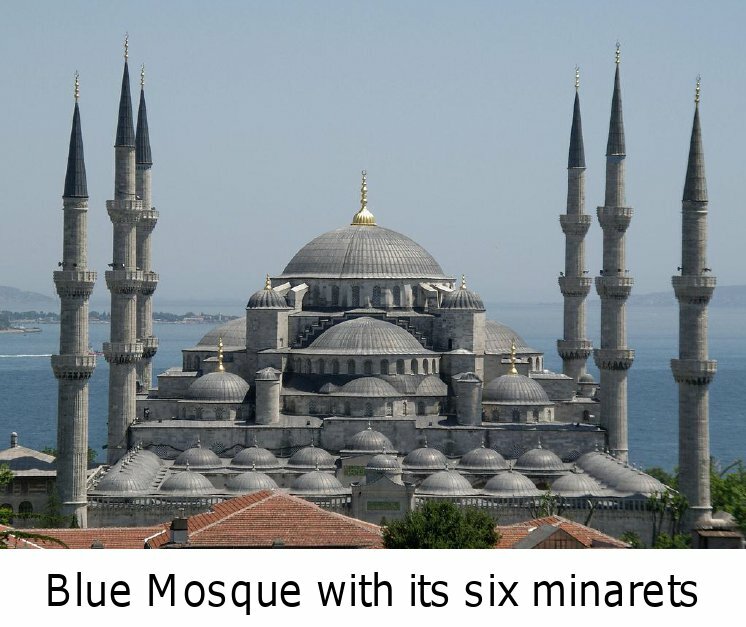 It is the largest mosque in Istanbul, and gets its name from the blue tiles adorning the walls of its interior. 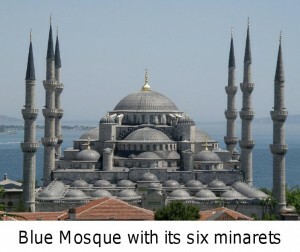 It has 8 domes and 6 minarets. A minaret is a tall spire that provides a visual focal point and is used for the call to prayer. Building 6 minarets at the time of construction had its controversy, as only the mosque in the Moslem holy city of Mecca had 6 minarets. All other mosques should have fewer minarets. This controversy was later solved by adding a 7th minaret to the Mecca mosque. The Ottoman Empire lasted until 1923. When the Ottoman Empire was defeated by the Allies in WWI, Turkish nationalists led by Mustafa Kernal Ataturk successfully waged a war of independence against the Allies, culminating in the establishment of the modern Republic of Turkey in 1923. In conclusion, Byzantium/Constantinople/Istanbul is a beautiful and fascinating city. It has a gigantic harbor, beautiful sceneries, magnificent architectures, and a rich history at a location that is probably the most strategic location in the world. It is very good and brief history of Istanbul. Very good quality article. We are going to visit Turkey in first two weeks of May 2012. Keep up the good work. Maybe you can add some more on the cultural aspects of Turkey. The president of Turkey visited China this week. His first stop was Xinjiang (whose people may have similar origin as the Turkish people). Thanks for a very interesting history of Istanbul. I have not been to Turkey but I’m now hoping some day to visit.